Furnish your living room or entertainment area with the exceptional comfort and unique style of the Monika collection of upholstery furniture. Featuring a stationary sofa and loveseat with an optional chair, this collection has something the whole family can enjoy. With each item stuffed with thick boxed seat cushions, pillow-top arms, and plush channel-tufted back pillows, you are sure to experience the ultimate relaxation while sinking into its soft upholstery. 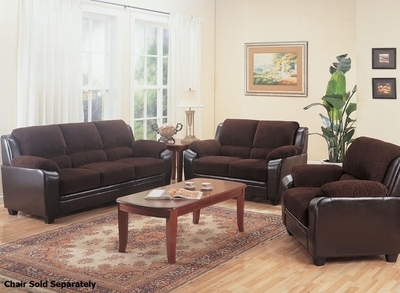 Draped in a unique two-toned fabric featuring corduroy fabric on top and sleek brown vinyl on the bottom, this collection is infused with a charming style that has both casual and contemporary influence - perfect for a variety of occasions and locations within your home.